There's more to consider now than just the cost benefits of extending the life cycle of roads. Environmental and energy issues have come to the forefront. Sustainability of non-renewable resources, decreased dependence on foreign oil, and improving the condition of our planet are serious concerns demanding better solutions now. New sustainability standards and measures are effecting the industry, challenging cities, counties, and D.O.T's to revamp and enhance their road maintenance goals. Because of its unique process, Cutler's single-pass, hot-in-place recycling has been part of the solution for decades, and is a key component in the future of road maintenance programs. Since 1965, Cutler's single pass recycling process has reused more than 12 million tons of asphalt that otherwise might have gone into landfills. Hot-in-place recycling uses 50% less aggregate and 50% less asphalt cement than conventional equivalent methods. 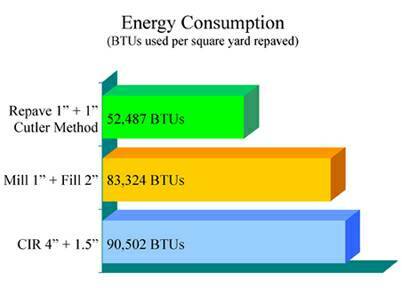 In addition to the benefits of recycled material, Cutler's hot-in-place recycling process provides a smaller energy-consumption and emissions profile, cumulatively, than nearly every other surface reconstruction method. Lower energy consumption is important for cost savings and resource conservation. A landmark study conducted by the Federal Highway Administration demonstrated that hot in-place recycling consumes 35% less energy than conventional paving methods. Cutler's customers also realize additional energy savings through reduced trucking and milling costs, and recycling of non-renewable materials. 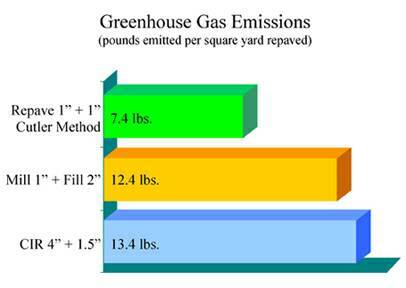 Energy consumption and emissions also figure into the LEED-ND evaluation of the process. For more information about one Colorado city's criteria for sustainable construction based on LEED-ND, and the significant role hot-in-place recycling plays in its road maintenance program, read Cutler Courier Focus on Colorado, Summer 2008 and Hot-In-Place Recycling Helps Denver Meet Sustainability Goals.